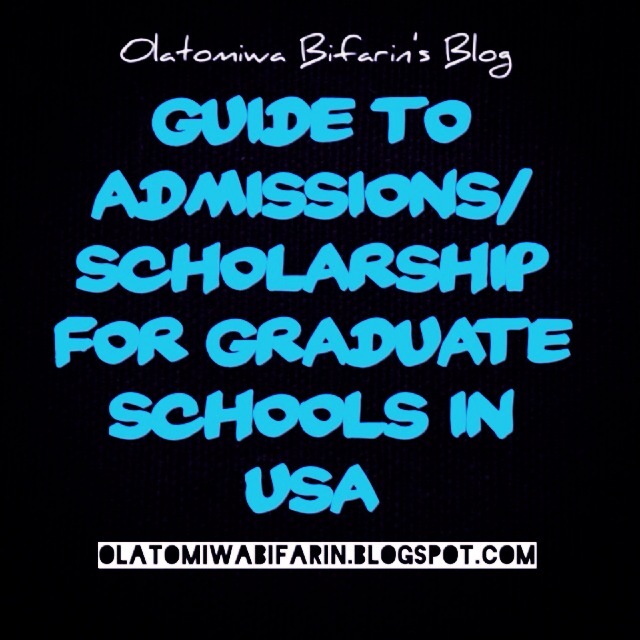 Below I highlight the basic information needed for admissions into graduate school in the United States: This first part covers planning, preparation of transcripts, and examinations, while the second part will cover scholarship and application informations. Application to graduate schools in the United States is relatively lengthy compared to graduate schools in countries like the United Kingdom. Therefore, I would advise you start preparation around twelve months before your proposed start date for optima results. For example, if you are planning to start your program by Fall 2016 (August) it’s very imperative you start taking (not preparing, taking) examinations around August 2015 and delving for schools much earlier before that date: this is very essential for doctorate programs. Planning essentially involves taking the required examinations, preparation of academic transcripts, searching for schools and, of course, applications. The United States uses the 4.0 scale grade point average system while we use 5.0 scale in Nigeria. Therefore it may be important to convert your C.G.P.A to the American format i.e 4.0 scale. To know your American G.P.A you have to evaluate your transcript through World educational services (WES). The process include the following: send the transcript for your bachelor’s degree to WES, at a specified fee, they will convert your G.P.A on a course by course basis to generate the 4.0 scale American G.P.A. Afterwards, WES would be the institution to forward transcripts to the recipient schools for application. Visit www.wes.org for more details. Note that evaluation methods depends on the school you are applying to; while some schools will require you to do it through WES, some universities do it themselves by charging a fee during the application process. The Graduate Record Examinations (GRE) is one of the most important examinations required by graduate schools in the United States. They are of two types: (i) the revised general GRE test, this examination basically test your quantitative, verbal and writing skills. This is required by all graduate schools (Some graduate school do not require the GRE especially if the applicant is not applying for financial aids) (ii) The GRE subject test: it’s an examination on a specific subject relating to the proposed graduate studies; for example, a person who is applying for a graduate program in molecular biology might be asked to provide a GRE Biochemistry subject test score, however, this is rarely required. www.ets.org/gre is the Uniform Resource Locator for the GRE test. You can get all information needed about these examinations on the website. Based on personal experience, the revised general GRE test is an exam that should not be rushed. If you are ill-prepared you will do a bad job really good. ‘Experts’ advice to prepare for 2 – 6 months. This will most likely be beneficial if you are applying for scholarship; for example most prospective international students that seek teaching/research assistantships will have to submit an English proficiency score. TOEFL is quite an easy exam that essentially test your speaking, reading, listening and writing in the English Language. Again, www.ets.org/toefl is the Uniform Resource Locator for TOEFL. You can get all information needed about these examination on the website.